Most people need to learn how to hunt to get better. Although some hunters profess to have been a good hunter straight out of the womb, don’t believe them. It takes time, patience, practice, and knowledge to become a good hunter. That’s where bird hunting TV shows come in. Many hunters use these shows as a way to learn new techniques of how to hunt birds. There are many different things these TV shows can teach you. Nearly every hunter would benefit from watching them. Many shows talk about the equipment that you can use while you are out hunting. Each hunter has an item or items that they swear by. Since these shows are run and hosted by actual hunters, you can take their word that what they are suggesting to use is useful and good. A lot of time they will show a new technology or item that aids the known benefits of bird hunting. They will then demonstrate the item by using it to hunt an actual bird. This way you can see if the thing actually works. If it does, and you like it, the hunters will tell you where to go to buy it. Since most of the TV shows are made locally, it will be easy to find the store that they suggest. Another thing that these shows do to help their fellow bird hunters is to teach new techniques. Most people learn to just see a bird and shoot it. The people who host them try to teach people that there is a bit more finesse and technique involved in the sport. They will describe the technique to you, and then demonstrate it by using it to kill a bird. Pay close attention to what they do. The hosts of these shows are generally very experienced and professional. They have been hunting birds for many years and know what they are doing. After all, they wouldn’t have gotten their own TV show if they didn’t know anything about hunting birds. Sometimes it’s just fun to watch hunters hunt birds because it is something that interests you. You don’t need to be in it to learn to enjoy the TV shows. Most of these shows are presented to feel like the host is actually hanging out with the viewer, making them feel like they are there. 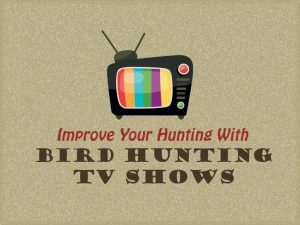 Whether you plan to watch the shows to learn new techniques, see which items are good for hunting, or just want to watch another man hunt a bird, you can benefit from watching bird hunting TV shows.